Genre: It’s a ghost story, but it’s not really Horror or Fantasy; there are Unspeakable Dark Secrets that people are keeping, but it’s not really a mystery. General Fiction, I guess, for lack of something better. Why do I have it? I loved The Time Traveler’s Wife, and a number of lucky-ducks who got an ARC said it was great, so I had to request it. Review: While this book didn’t have the same emotional impact on me as did The Time Traveler’s Wife, it did have the same depth of characterization, the same intricate plotting, and the same compulsive readability. (It also had a very similar underlying theme of “How much can love survive?”) Starting at the beginning, Niffenegger does an excellent job of introducing, distinguishing, and building her characters; they’re all quirky, but no so quirky as to feel like cariacatures. They felt multi-layered and real enough that even when they were making bad decisions, I recognized those decisions as being entirely in character. The structure of the book is also well-done, the parallels between characters and events are always present, lending the book itself the symmetry of the title, without ever being intrusive. There are parts that got as complicated as anything in TTW (I had to make myself a little chart on my bookmark to keep track of one bit), but for the most part, it’s handled smoothly. The best part about this book, however, was its absorbing, compulsively readable nature. I was sucked in very quickly, and then stayed up way past my bedtime for three nights running. I am apparently a big sucker for the Huge Unspeakably Bad Secrets from the Past plot device, and for three nights in a row, I couldn’t just put the book down and go to sleep… I mean, what if one of those secrets were explained in the very next chapter?!? (As it turns out, the penny finally dropped when I had two minutes left to read before I had to go lead a review session. Argh!) Also nice was that after ratcheting up all of that suspense, the Huge Unspeakably Bad Secrets a) weren’t super-predictable, and b) weren’t disappointing. The ending did a nice job of wrapping up the various threads while still keeping me involved, especially since by the end of the book, the only character I really still liked was Martin (see above re: bad decisions). So, while it didn’t leave me in a soggy puddle of tears like TTW, it was an addictingly good read, atmospheric and subtly creepy without being scary, intricately plotted and themed without being overbearingly Literary, and overall just a fascinating and very enjoyable read. 4.5 out of 5 stars. Recommendation: Anyone who likes Victorian ghost stories or the atmosphere of Gothic mysteries should definitely check this out, as should those who are just in the mood for an engrossing read. First Line: Elspeth died while Robert was standing in front of a vending machine watching tea shoot into a small paper cup. Cover Thoughts: Love it. The branches are wonderfully creepy, especially if you think of them like what the November view would be from one of the graves inside Highgate. Also, it’s kind of shiny/reflective, and I’m kind of like a crow when it comes to anything sparkly. p. 14: “His head was still bowed and he seemed to be intent on each sett in the courtyard as he walked across it.” – a small, rectangular paving stone. Great review! I have it to read to, and this makes me looking forward to it. I liked TTTW, but gothic novels are more of my type, so I have a good feeling about it – especially after reading your view on it. I have this book and it is causing me to face such a dilemma. Do I read it first and abandon all my challenges that need to be read by December 31st or do I read the challenge books first. I can see my will power failing miserably. Vivienne – I am perhaps the wrong person to give advice, since I don’t really participate in challenges, but I say read what makes you happy. I loved this book! Like you said, I didn’t find the surprises very predictable. Thanks for linking my review! Lola – I thought Niffenegger did a nice job with keeping the surprises interesting but not *totally* out of left field. The reviews on this book are so mixed, I don’t know what to think. I haven’t read The Time Traveler’s Wife yet, so I think I’ll start with it. Jenny – Agreed! It felt like the story-building bones were the same – similar themes, same writing skill – but the resultant stories were very different. Lightheaded – Hmm, I’ve only read TTTW once, so I can’t compare. Maybe I’d hate it on round 2 as well. :) What did you hate about it? If it was the style or the writing, then yeah, you might want to steer clear of Her Fearful Symmetry, but if it was something about the characters or the story, then you’ll probably be okay, as they’re quite different. It was more on the characters and the story. The nitpicker in me started uh, nitpicking since I already knew how things turned out :) Then again, I think I’m the only one who reread TTTW and hated it that second time :) I sure heard a lot of positive things about this book. I loved this book, so I’m soooo glad you liked it too! Nymeth – I think you’ll really like it, not least because it’s got a very Victorian air to it. I’m scared to death of horror stories. So, I’m going to pass. I too am “a big sucker for the Huge Unspeakably Bad Secrets from the Past plot device.” I have to keep going until I found it out! I loved the book. I pictured TTTW completey differently than this one and almost think that they are incomparable because they are so different. I did love this book though. Tracie – Any recommendations for other books with good HUBSftP? I loved TTTW. I read it about 4 or 5 years ago on vacation at the Outer Banks. My teenage daughter had brought it with her and I picked it up one night after she went to bed.The guys were out flounder gigging so I usually stayed up pretty late. The first thing I knew I had been sucked in and read till the sun came up. Over the next two days every time she laid it down I grabbed it. She and I talked about what was going on so much in the book that by midweek my daughter-in-law was reading it too. You should have seen us three trying to read it at the same time, discuss it, and try not to spoil it for those who had not discover something yet. If HFS is half as good I must get a copy right away. Lisa – What a great story! I hope you like HFS just as much! I really did not enjoy the ending to TTW, so I was hesitant to read this one, but really liked it! I reviewed it on my blog: Beth’s Book-Nook Blog http://www.drbethnolan.wordpress.com. Beth – I’ve added your link; thanks for pointing it out! I am one that liked this book so much more then Time Traveler’s Wife. I think the hype of TTW raised my expectations to an unattainable level. I am excited for future books by the author since, as you mentioned, her wonderful writing style was the same but the stories themselves were completely different and difficult to compare. christine – Ah, I was lucky enough to get to TTTW before I’d been overly swayed by the hype – enough to get me to pick it up, but not so much to bias my reading. I hate when it happens the other way! Great review! I’m glad to read you liked it! I’m really excited to read this one, even though it has gotten some mixed reviews elsewhere in the blogosphere. I’m a sucker for Huge Unspeakably Bad Secrets From the Past plot devices too, lol! Our book club just read this one. I loved the description of the cemetry and the eccentric characters. I also loved the page-turning quality of the plot (I’m a sucker for big secrets,too). But, by the end of the book, I had a hard time liking any of the main characters. This made the story a lot less enjoyable for me, particularly as I didn’t feel the all got was coming to them in the end-both good and bad. A couple of our members liked it until the end, which they felt was unsatisfying. A couple liked it so much they felt it was superior to Time Traveler’s Wife. Personally, I felt TTW was superior in every way, mainly because I truly loved the characters in that story and felt deeply invested in their lives. With this one, I kind of wanted them to just go away! This is a excellent and concise review. 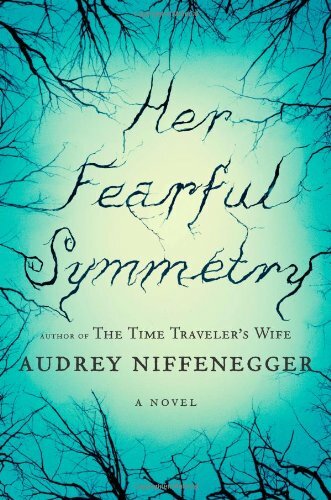 I’ve been thinking about reading’Her Fearful Symmetry’ but wasn’t sure if it would be something that I would like. However after reading your review, I will give this book a go!